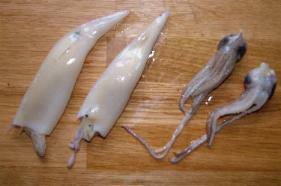 Squid is a very versatile bait that can be used on its own, in a large cocktail or as a small tipping bait. 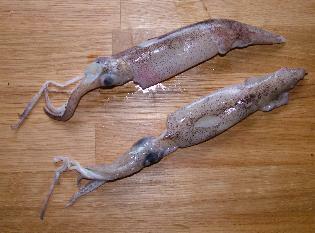 Firstly remove the heads from the squid and set aside. 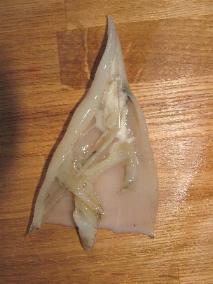 Then remove the wings and outer skin by peeling them from the squid body. 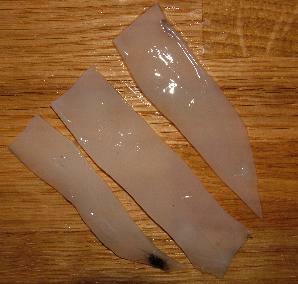 Cut the squid to open it flat, exposing the inside. You are now left with one squid body, the squid guts and a plastic spine. You can now discard the spine. The guts can be retained. They sometimes make an exceptional bait for various species. Below a selection of uses for squid as hook bait. Cut the squid into strips. 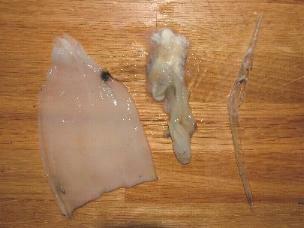 Squid heads are a great bait for all manner of species, including rays, huss and dogfish.